So many people get uptight at the thought of Thanksgiving and the roast Turkey dinner, but if you look at it as just a big chicken it does not seem so formidable. The real key though is to keep it simple, do not be intimidated by all the TV chefs with all the fancy side dishes that you “must do this year”. If you are intent on making one of these “in” dishes, don’t make it for the first time on Thanksgiving. Try it out a few times before,so you have your techniques and time down and you are sure your family thinks it tastes great. Thanksgiving is more about tradition. What were the favorite dishes your Grandmother and Mother made, and what are your family and friends favorites? Everyone wants the “Norman Rockwell” version of Thanksgiving, but if you look at the painting closely it is a Turkey with one covered side dish, a plate of celery, a plate of pickles, a bowl of fruit, a cranberry jelly mold and gravy. Simple! For the dinner itself Logistics is the key. Plan out your menu well in advance, making sure that you will be able to cook all the things you are planning with the stove tops, ovens and microwaves you have available. Once your turkey has been cooked it should rest for 15 – 30 minutes to allow the juices to settle in the meat, tenting it with foil will give you 30 minutes to finish all the side dishes. Now on to the turkey! The first big question here is just how big a bird do you cook? I would think that a rule of thumb would be 1½ to 2 pounds per person. The larger the bird the more meat so as you lighten the turkey raise the amount per person. For the average family of 6 -12 people for dinner, 2#’s per person should work well. The second question is to stuff or not to stuff? Unstuffed will cook faster, and you have less risk of Salmonella poisoning. If you stuff make very sure that the center of the stuffing is at 165° or higher. If you stuffed it to tightly you may end up with an overdone turkey and under done stuffing. While a stuffed turkey does add flavor and moisture to the stuffing, when in doubt go with the stove top stuffing and leave it out of the bird. Whole turkey size determined by the number of people it is going to serve. A good baster or heavy duty large spoon. Thaw the turkey, again the size determines how long this will take. Err on the side of caution and allow 12-24 hours longer than stated to be safe, there are a number of web sites that will give estimates. Leave the turkey in its original packaging until just before you are ready to cook. When you are ready, remove from the packaging take the giblets pack out ( these will be used for the gravy), rinse the bird in cold water and pat dry. Tuck the wings in and with the twine lightly bind the leg ends together to help close the bird’s cavity. You can, if not stuffing the bird, add salt and pepper, the celery tops and a quatered onion into the cavity. Place the bird on a rack in a roasting pan ( if you don’t have a rack use the carrots whole and the celery as a rack at the bottom of the pan). With a brush, coat the whole bird with the oil and then lightly salt and liberally pepper the outside and inside of the bird. Place the bird breast side up on the rack and spread the onion, carrot and celery on the bottom of the pan, add enough stock or wine to lightly cover the bottom of the pan. Place into the lower third of the preheated oven. Check the bottom of the pan about every 30-45 minutes, keeping the bottom of the pan moist( if it looks dry add a little more stock or wine) so the juices do not burn, while checking baste the bird with the juices to keep it moist. When the time is about 2/3 done, keep and eye on the bird , if it begins to brown too much cover loosely with a tent of foil. Once the turkey reaches it’s final temperature remove to a cutting board and cover tightly with foil to rest for 30 minutes. The juices left in the pan should be Strained and added to the gravy you make with the giblets( see turkey gravy). For the best advice go to the Butterball web site to find times for all the various turkey products. Cooking times are approximate, determine when the turkey is done by temperature, and whatever you do do not trust the pop up thermometer in the breast they are unreliable. The Turkey is done when the temperature of the thickest part of the thigh away from the bone is 180º and the breast is 165º. If stuffed make sure the center of the stuffing is 165º or more. To Carve at the table or Not to Carve. Here we have another or the Great Thanksgiving conundrums, do you carve at the table or not? My thoughts are if you are a master carver and want to show off then by all means do it at the table. For everyone one else it is far easier to do it in the kitchen and quite frankly I disagree with the time honored way of slicing the breast off the bird. To carve a Turkey is actually quite a simple task, again just think of it as a “big” chicken. Remove the wings at the joint nearest the bird then separate the three pieces at the joints of the wings. Now slice down between the thigh and the bird through that joint remove the thigh and drum stick and then slice between the thigh and drumstick. I leave the drumstick whole but slice the meat away from the bone on the thigh. Now carefully slice across the top of the bird between both breast pieces and with you knife flat against the ribs slowly slice the whole breast off the bird place on the cutting board a slice thinly perpendicular to the breast against the grain. You will end up more slices of white meat the a juicier and moister. Want to practice, try a few baked chicken before Thanksgiving to get the hang of it! I get the giblets, gravy and lots of leftovers, it’s a week of heaven- too bad we don’t cook a 100 pound turkey it could last a month! 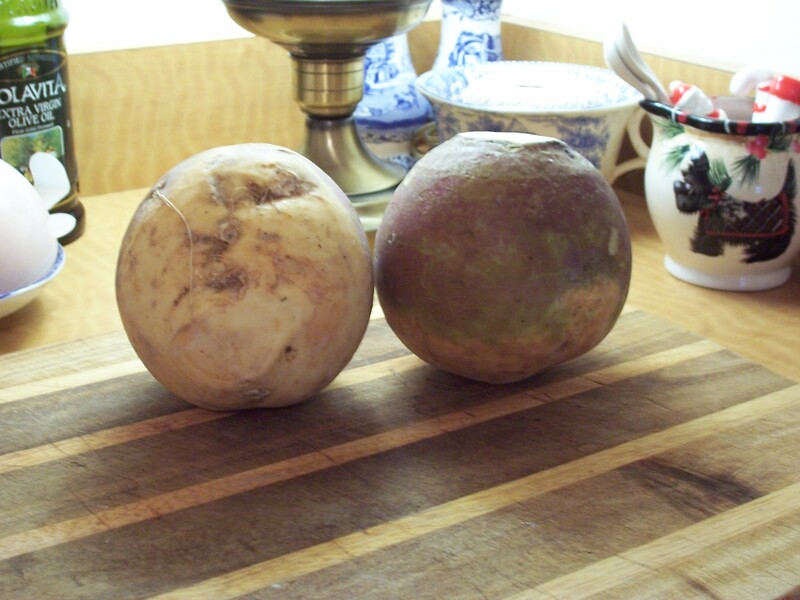 Rutabaga, yellow turnip, swede, neeps, tumshie whatever the name, it’s one of those vegetables that’s a love it or leave it choice. There really isn’t a middle ground with turnips, while some start watering at the mouth with the smell of them cooking, others run from the room. The general consensus is the best way to serve is to mash. The secret is to cut the rutabaga up into equal size pieces. Not an easy task as it is a fairly dense root, but a good large sharp knife will do the trick. The easiest way to peel is to cut into quarters and use the knife to slice the waxy skin off, there is a pithy layer that is slightly bitter just under the skin so don’t be afraid to take a good slice off. Cutting into quarters gives you 2 flat surfaces to place onto the cutting board, slice around the bottom of the quarter then turn over and do the same to the other edge. You now have only to slice the center of the quarters to peel all the waxy layer off. Then cut into 1/2 cubes, being careful to watch your fingers as you slice. Take a large pot with salted water and bring the water up to a boil, add the rutabaga and boil until fork tender. Drain, add butter and a little salt and pepper and mash. It’s that simple. If you have a good stand mixer with a paddle blade it will do a great job of the mashing. They do get better if they sit overnight and are rewarmed the next day, simply put into a baking pan and heat with a few pats of butter on the top, serve hot. There are of course other ways to serve. 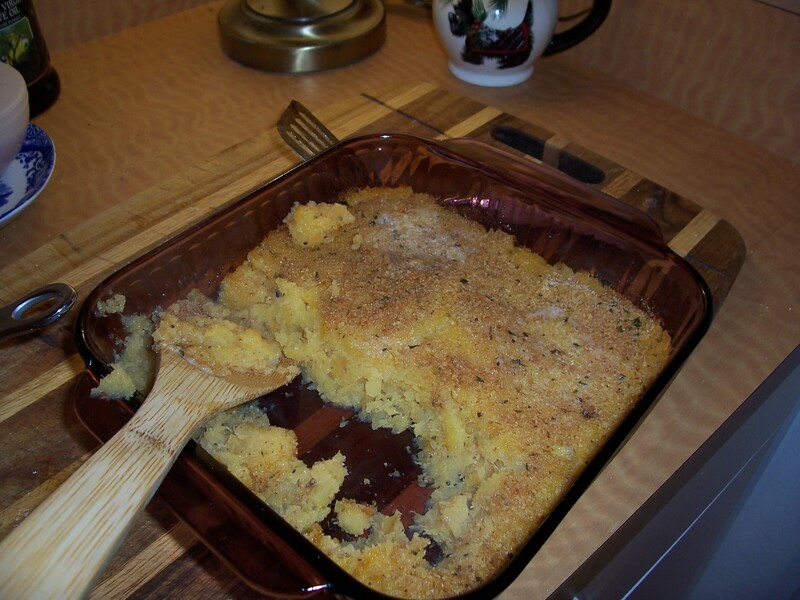 In Finland there is a casserole starring the rutabaga made for Christmas it adds milk breadcrumbs, molasses, egg, ginger,pepper, nutmeg and salt. Another way to serve is to combine with a few carrots in the mash or add sour cream, in fact the choices are endless. You can add with other winter root vegetables and roast or just oven roast by itself. Slice into very thin julienne to serve on a salad. Cut into small cubes it can be added to stews or pureed to thicken soups . So the next time your in the grocery store, pick a couple up and give it a try. Add it to your repertoire. 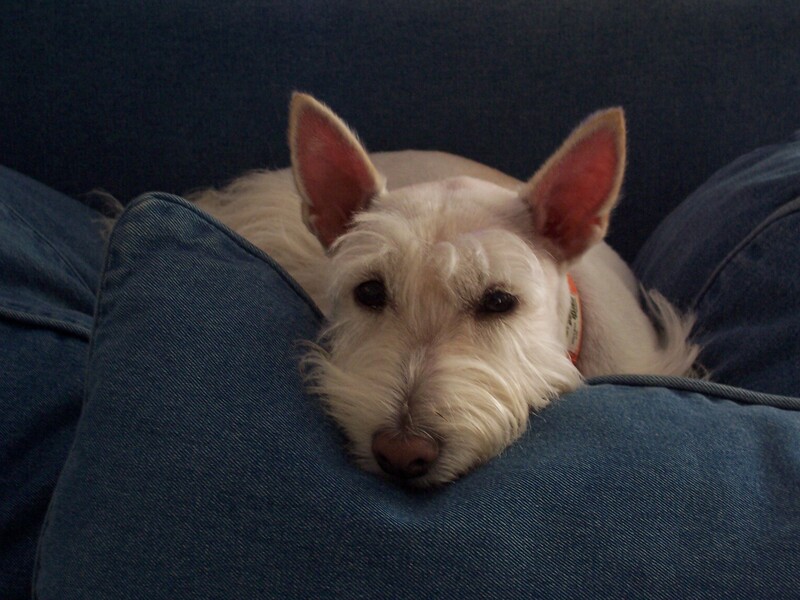 While I do find the aroma interesting, they will certainly never replace a nice slice of roast beef or turkey and I’m not that crazy about vegetables by themselves so 3 paws for the effort.